Bryant Bozarth, Willis G. Burks, Green B. Barton, Nancy Gum, Alfred Devore, Presley M. Deore, James Devore, Calvin Dial, Samuel Dunnington, Wm. T. Hill, Wm. Houser, Bluford Lutrell, Henry Lutrell, James Lutter, Samuel Payne, Wm. Lee, James Wall, Adam Wall, John Williams, Wm. Wall, James Williams, Jesse Witt, Benjamin Workman, and Isaac Workman. In 1859, Edward and Celia Hawks entered land in Miller County and homestead the Northeast quarter of the Southwest quarter of Section 26, Township 39, Range 14. This land is located on Hwy 42 and west of Hwy. U in Glaize Township. Four years later they sold their 40 acres to Henry J. and Celia F. Luttrell. The same year, 1863, the Luttrell's homesteaded 160 acres surrounding the Hawk's property, so apparently Edward and Celia Hawks decided to sell their 40 acres giving the Luttrell's 200 acres in that area of Miller County. On 4 April 1870, Henry and Celia Luttrell conveyed a two-acre parcel in the Northeast corner of their 200 acres to the Trustees of School District No. 5. The trustees named included Jesse Gumm, A. S. Graham, G. W. Graham, A. Bear and Isaac Robinett and the trustees purchased this land for $1.50. A school was built on the site and it sat beside the old road that led from Iberia to Brumley. For many years it was called School No. 5, but later it was named Honey Springs District No. 71. In 1927, the two-acre school site was conveyed to H. Frank Thomas. 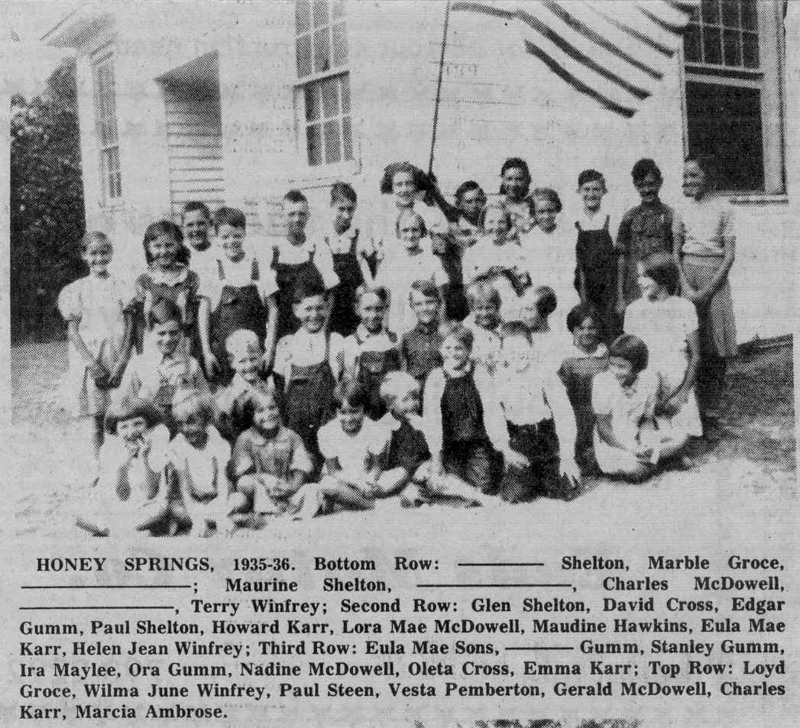 It was located near the present site of the Honey Springs Baptist Church, which faces Hwy. 42, a few miles east of Brumley. I think the school remained open until the consolidation of the country schools in 1958. 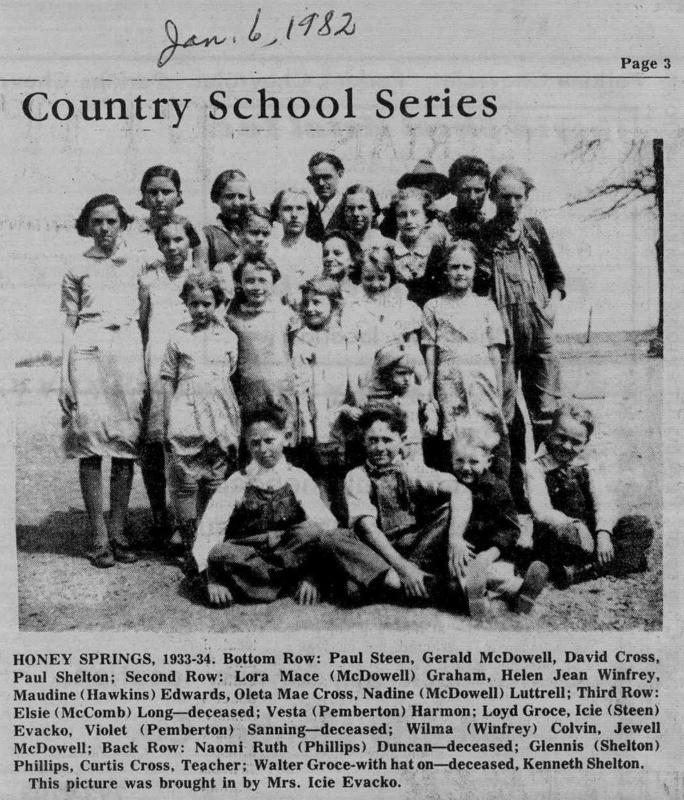 During the school year 1957-58, it was still known as Honey Springs School #71 and was being taught by Charles Cox. There were 27 students enrolled. The school board consisted of Waldo Steen, president; Violet Meyers, clerk; Ovid Luttrell and Spurgeon Shelton, members of the board.